1st Lt Alexander “Blackie” Bell was flying an L at 14,000 feet near Kauai per-dawn on October 19, 1959. His radar transmitting might began to fo off and on … and then there was smoke in the cockpit. The forward fire warning light came on … it was standard operating procedure for immediate bail-out when this “panic” light went on, Lt Bell queried his wingman, who reported no visual sign of fire but some sparks seemed be coming out of the tailpipe. Lt Bell throttled bak and turned towards Lihue, some five miles away, He made it son safety – a power-off landing on the then-5,100 foot runway. 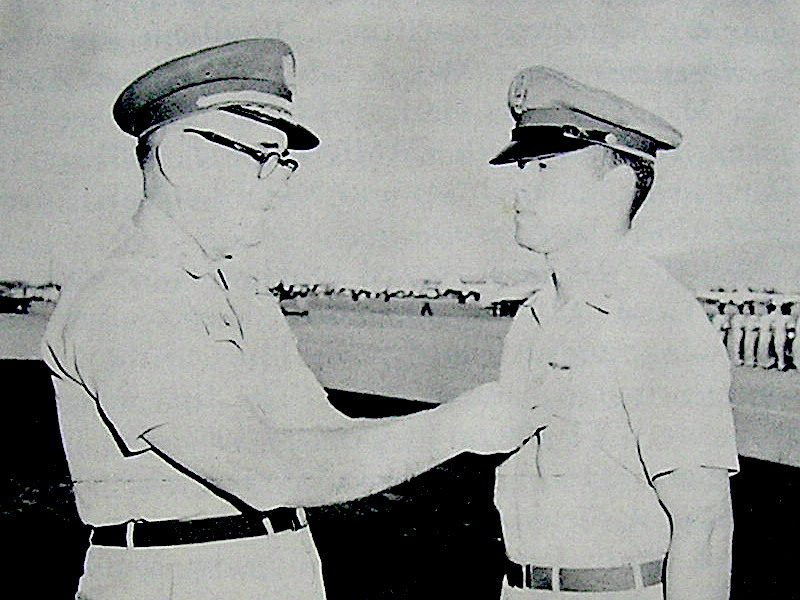 Lt Bell was awarded the Hawaii National Guard Medal for Merit and the U.S. Air Force awarded him the Air Medal for this deed. Special thanks to Steve Lum who scanned this photograph. Blackie flew with the 199th Fighter Squadron until 1968 and later retired from the Air Force Reserve. In civilian life he flew for Hawaiian Airlines until meting in November 3, 1990. During his last 20 years with Hawaiian, he was as a line pilot, check airman (Convair 600, DC-9, DC-8, L-1011) and later Vice President of Operations. Two weeks after retiring from Hawaiian, Blackie, John Carroll, and Jim Davis started Hawaii Aviation Contract Services (HACS). The company was a crew leasing business. Blackie later bought out his partners and the company continues today as one of the premier crew leasing companies serving several major airlines.